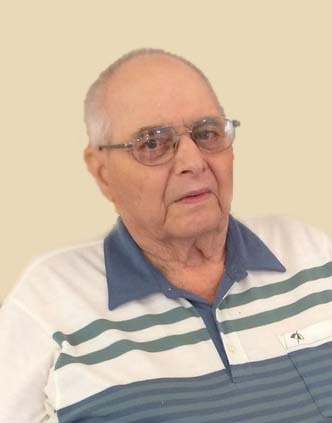 Benedict Mark Hutmacher 92 years, of Bethany Pioneer Village formerly of Bruno passed away peacefully at Humboldt District Hospital on Thursday, June 14, 2018. Ben was born on April 25, 1926 to Joesph and Philipina (nee Linde) Hutmacher in Bruno the youngest of 12 children. He obtained a grade 8 education at the Hoffman School. Following he ventured out to Ontario for employment and then later to British Columbia where he worked in a Smelter at Trail, BC during the war. His father passed away at this time and he was able to be discharged and go home to help his mother with the farm. The return to Saskatchewan was a very positive move as he then met the love of his life Lottie Lemke at a dance and they were married on November 12, 1946 at Bruno. Together they began their life on Ben’s parents homestead. They were blessed with three children. He thoroughly enjoyed his farming lifestyle and all aspects of running a mixed farm. He loved gardening and helped Lottie whenever he could. Life was not all work Ben and Lottie loved to dance and attended many dances in the area. Family was important to Ben and spending time with his immediate and extended family made him feel fulfilled. Ben’s faith was very important to him and attended mass regularly. In 1977 Ben and Lottie retired to Bruno and Ben began working at Ursaline Convent as a gardener and grounds keeper. He had a passion for gardening so this job was his dream job. He thoroughly enjoyed his time with the nuns. He worked hard and they treated him very well. After retirement he was able to go for coffee with his friends and catch up on the local news “Gossip”. As their health began to fail they moved to Kinsmen Court in Humboldt, again a life style he adapted well to as he continued with his coffee/visiting routine at Trans Café twice a day. Ben loved visiting, reminiscing about old times and telling a few good stories. In 2010 the love of his life died. A few years later he moved to Bethany, a move that was very difficult for him to adjust to. He missed his coffee buddies and he was unable to drive anymore. If you knew Ben you will miss his favorite comment when you asked him how he was he would always reply “One day closer to Christmas”! Ben will be sadly missed and lovingly remembered by his three children two grandchildren and five great grandchildren: Robert (Suzanne) Hutmacher of Castlegar, BC; Karen Washkosky and family Jody (Shannon) Washkosky and children Jake and Watson and Trent (Christie) Washkosky and children Mary, Eva and Finn all of Saskatoon; and Allen Hutmacher of Humboldt; numerous nieces and nephews. Ben was predeceased by his wife Lottie Hutmacher; child in infancy; parents Joseph and Philipina (nee Linde) Hutmacher; son-in-law Daniel Washkosky and 11 siblings: John and Beatrice Hutmacher, Joseph and Rose Hutmacher, Elizabeth Hutmacher, William and Margaret Hutmacher, Tony and Francis Hutmacher, Emalina and Alois Helgert, Regina and Jack Wright, Alphonse and Margaret Hutmacher, Annie and Alois Ebner, Leo and Margaret Hutmacher and Raymond Hutmacher. A Funeral Mass was held on Wednesday, June 20, 2018 at St. Bruno R.C. Church at 10:00 a.m. Celebrated by, Fr. Pius Schroh. Interment followed at St. Bruno R.C. Cemetery, Bruno. Memorial donations in Benedict’s memory may be directed to Humboldt District Hospital, Bethany Pioneer Village or Bruno Friendship Center.